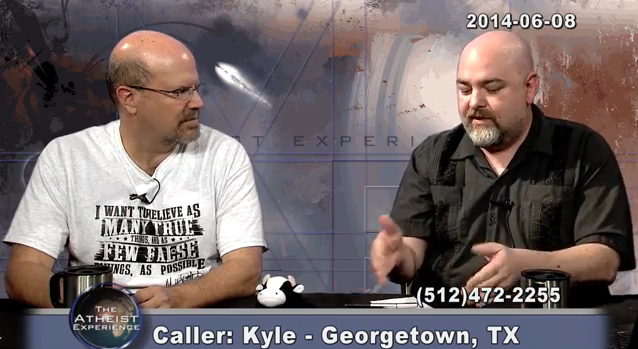 Last May, Matt Dillahunty debated presuppositional apologist Sye Ten Bruggencate in front of a live audience at the Marriot East's Grand Ballroom in Memphis, Tennessee. The exchange was moderated by David Smalley of Dogma Debate. Although it was a lively exchange between the two debaters, it was uninteresting (and often annoying) due in most part because of Bruggencate's hard-headedness. I, like many others, thought that Dillahunty mastered his opponent that night (or was it day?). A couple of weeks later, the debate was momentarily discussed on the 869th episode of the the show The Atheist Experience which was hosted by Dillahunty himself and John Iacoletti. Dillahunty divulged a bit of information about some negative things that happened after the show like Bruggencate refusing to have a picture of him and the woman who organized the debate taken. And I particularly had a few laughs with Iacoletti's "Top Ten Things I Learned at the Sye Ten Bruggencate Debate". The hosts answered calls thereafter. Watch the episode below.